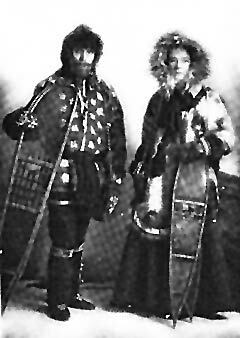 The first concentrated Anglican missionary work around the confluence of the Tanana and Yukon Rivers (near the present town of Tanana) began under the auspices of the Church of England in 1888 with the arrival of the Reverend Thomas Henry Canham (1852-1947) and his wife Charlotte Sarah French Canham (1845-1921). 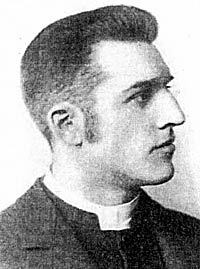 The first missionaries of the Episcopal Church in the United States to work here were Jules Louis Prevost (1863-1937) and his wife Anna Louise, who served as missionaries in central Alaska from 1892 to 1906, mostly based near Tanana. 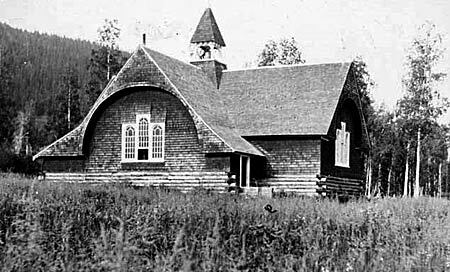 For further information on Jules Prevost and the history of the Episcopal Church in Alaska, see Hudson Stuck's The Alaskan Missions of the Episcopal Church. Dr. John Ritter of the Yukon Native Language Centre identifies the language of this translation as Upper Koyukon, an Athabaskan language spoken in central Alaska along the Yukon River. It is today spoken by fewer than 300 people out of an ethnic population of some 2300. William Muss-Arnolt discusses the history of this translation in Chapter LXXII of The Book of Common Prayer among the Nations of the World; it is listed as no. 170:1 in David Griffiths’ Bibliography of the Book of Common Prayer 1549-1999. 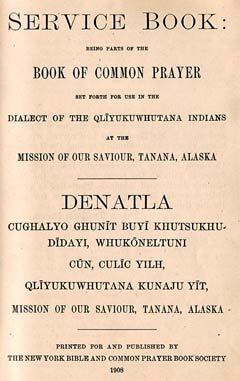 Both Muss-Arnolt and Griffiths identify the language incorrectly as Tanana, which is a different language spoken farther to the east, along the Tanana River. Note that this text uses several diacriticals, two which may be problematic. These are the "a" and "o" with a dot over, which are part of Unicode, but are supported by very few fonts. The font used here, Times New Roman, includes them only in newer versions supplied with Windows Vista and 7. In other operating systems, you will likely see a box where these characters are supposed to be. Fortunately, they are seldom used in the text. This Indian Service Book is a translation of a selection from The Book of Common Prayer, and made by the Rev. Jules L. Prevost, who for many years was missionary among the Tanana-Yukon Indians. The New York Bible and Common Prayer Book Society has kindly offered to publish the same for use in the Missionary District of Alaska. The offer is gratefully accepted and my consent given for publishing this book. The characters used in this dialect are twenty-two in number, the same as in English, except F, P, R and X, which are omitted. The vowel sounds, primary and combined, are represented by fourteen distinct characters, there being as many syllables in a word as there are vowels. o, as (ou) in bought. ō, as (ow) in know. ȧ, as (ai) in aisle. ȯ, as (oi) in oil. The consonants used have the same value as in English, excepting C, which represents “tsh” as (tch) in catch, and Q, which has a strong explosive sound of K, as the Hebrew Qoph. thl is like the double L (ll) in Welsh. Initial. lh an aspirated L. Ending only. nh a nasal aspirate. Used as an ending only. gh resembles the Arabic Ghain. kh similar to the Arabic Kha. tt sharp, explosive sound of T. Initial. G is hard, as in get. S is hard, as in Sale. Th is sharp, as in Third.